The photo includes from left Flinkbein Zupelny Sukces "Milou", Cynia Moscic "Lani", Cedr Moscic "Ceder" and Flinkbein Srebro "Kingi". How often do you exercise your PON ? – Do you take your PON on regular walks every day or set aside special play sessions ? 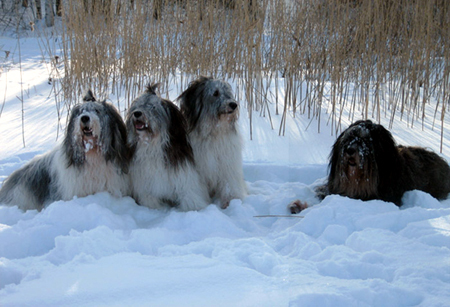 PONS are sheepdogs and need to exercise in order to maintain physical as well as mental health. It is a known fact that healthy bodies are better able to fight illness and exercise reduces the chances of obesity and the risks of diabetes, joint problems and heart disease as dog mature. Well balanced diet – Dietary requirements vary among dogs, due to differences in lifestyles, age, breed and health conditions. If your PON is a couch potato, you need to downsize the amount of food he receives or be faced with an overweight PON that is at high risk for a range of health issues. When was the last time you thought out of the kibble bag ? Do your own research and learn which foods offer nutritional benefits. If you aren't able to switch away from kibble, consider adding pumpkin, green beans, yogurt,etc. to your PON'S daily diet. Prevent Boredom – Lots of attention, exercise and a "job" serve to prevent boredom and the development of behavior problems in PONS. A happy, busy PON is more likely to be a healthy one. If you need to be away for several hours on a daily basis, leave a veggie filled "Kong" toy to work on while you are away. Make sure you have quality time together and plan activities you will both enjoy. Visits to local parks or long walks in the morning will make a big difference in the life of your PON. Vaccinations - Do your own thinking and research on this issue. Join Yahoogroups where owners compare experiences and information. Keep in contact with your breeder - There is a lot you can learn about your PON'S health history. Stay informed- Continue to do your own research on health issues, nutrition, vaccination policies. This knowledge will prolong the lifespan of your PON. Avoid being influenced by those with their own agenda. Every PON is an individual and as an informed PON owner, you can greatly influence the health and well being of your PON. PON Digest is dedicated to assisting each and every PON owner. If you have additional questions about PON health, weight management and other issues, please send us e-mails. We are here to help with a wide range of issues.